When running Motive on displays with high pixel density, (e.g. 4K resolution displays) the software UI may not be scaled properly and some of the buttons may appear to be very small on the screen. In these cases, you can simply adjust the windows configuration to prevent the scaling on high-resolution displays. Follow the below steps for configuring this. Under Settings section, click Change high DPI settings. This will bring up the properties window. 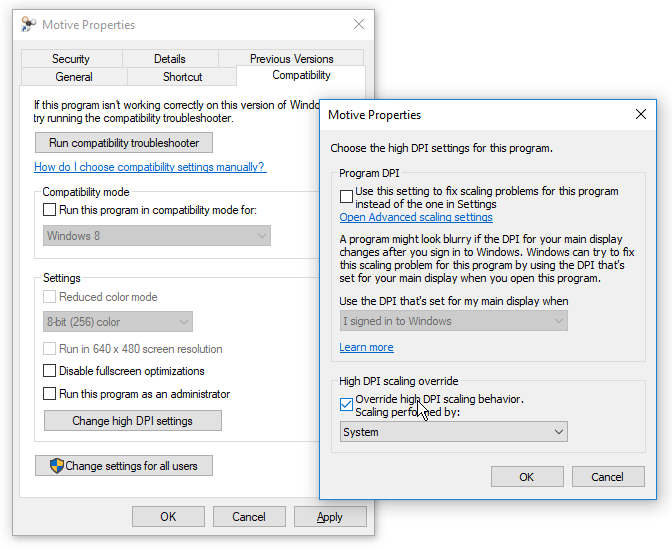 On the new pop-up window, click and check the box next to Override high DPI scaling behavior. Scaling performed by: setting. Lastly, make sure “System” option is selected in the drop-down menu as shown in the image below. Click OK to apply. This will override any incorrect scaling behavior when using Motive on high DPI displays. This page was last modified on 29 November 2018, at 12:39.